Whilst one of Edinburgh’s best loved visitor attractions lies concealed deep beneath the Royal Mile, there is nothing hidden about the attraction’s investment in their staff as Leanne Foxwell, Rob Atkinson and Jamie Balfour become the first staff members to complete a Modern Apprenticeship in Cultural & Heritage Venue Operations. The apprenticeship, delivered by Rewards Training, lead to both Rob and Leanne being promoted upon completion. 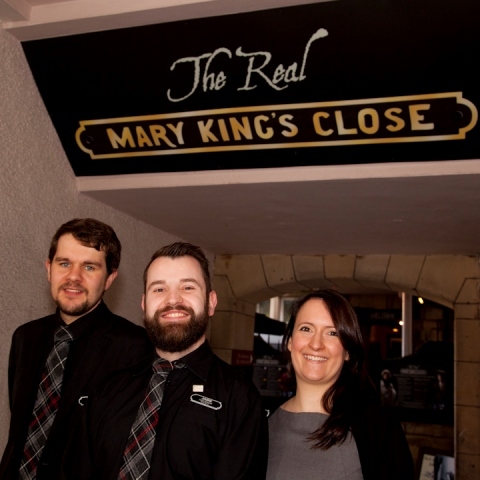 Apprentices are able to learn as they earn across all aspects of the business from event management to balancing the budgets, marking The Real Mary King’s Close’s continued investment in its employees to ensure a quality five star visitor experience. Following the success of the first intake of apprentices, the attraction is now investing in a further six staff from all areas of the business including tour guiding, sales and retail, giving employees exposure to the intricacies of running a successful visitor attraction that will see them gain valuable qualifications whilst on the job. The latest apprentices at The Real Mary King’s Close Scotland will be amongst the 25,000 employees per year who have access to Modern Apprenticeship place. As well as tourism, Modern Apprentices are employed across Scotland spanning more than 80 sectors including engineering, construction, health and social care, ICT, and food and drink. The announcement comes during Scottish Apprenticeship Week 2014 which focused on the benefits apprenticeships bring to businesses, individuals and the Scottish economy. Next PostNext It’s Raining Underground!